Joe Jonas and The WhalersJoe Jonas was born on a farm in rural Beaumont, Texas and began singing and playing harmonica as a child. He was barely in his teens when he came to the attention of the Zydeco King, Clifton Chernier, who took Joe on the road and featured him in his show as the Little Jimmy Reed Junior. In 1955 he moved to Dallas, put a band together, as played regularly in haunts like The Green Parrot, The ascot and the Zanzibar. Then in 1968 he relocated to Berkley, California where he met ZZ Hill�s brother, Matt, who promptly recorded and released the wonderful 45 rpm single �Hustler/Mojo Backfire� on his �Hill� record label. This made enough noise locally to be reissued on Fats Washington�s �Ride� Label. On the back on this Joe landed a regular job at Tiki Jacks, which was located close to the university and settled easily into the California blues scene. Unfortunately a series of knee and back problems in the mid 70�s saw him return to Dallas for both medical attention and recuperation which effectively put his musical career on hold for a number of years. By the early 80�s he was both on form and playing regularly at the Sho-Nuff Barbeque and numerous other clubs and bars around town, but it was not until 1993 that he again recorded. This time it was for �TopCat Records� who issued four tracks, as part of a �Texas Bluesman� compilation, together with work from Robert Ealey and Curley �Barefoot� Miller. This package then toured extensively throughout the States and Europe. 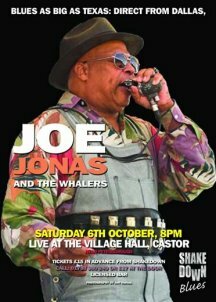 At the same time Joe was touting a self produced demo cassette wherein he again reprised �Hustler/Mojo Backfire� together with four other mainly self-penned tracks. It was also in the November of that year that Joe was featured in the late lamented Utrecht Estaffete, In Holland, where he was very well received.